Is there any image that illustrates the comforts of babyhood better than a sleepy infant sucking its thumb? Ultrasound pictures have shown, to the joy of many prospective parents, that this behavior can even occur in the womb. The thumb- or finger-sucking habit seems to relax and comfort toddlers too, and it's perfectly natural. But as a child grows, there comes a point where this habit isn't just socially awkward — it may also be harmful to his or her oral health. In most children, thumb sucking stops on its own between the ages of two and four years. But if the practice persists after age 3, it can change the growth patterns of the jaw, and cause significant misalignment of the teeth. It may be hard to believe that such a benign habit can actually move teeth and bone — but there are a number reasons why this occurs. Children's jaws, rich in blood supply and growing rapidly, are relatively soft and flexible — especially in kids under the age of eight. So it really isn't hard for the constant pressure of a thumb or finger to deform the soft bone around the upper and lower front teeth. 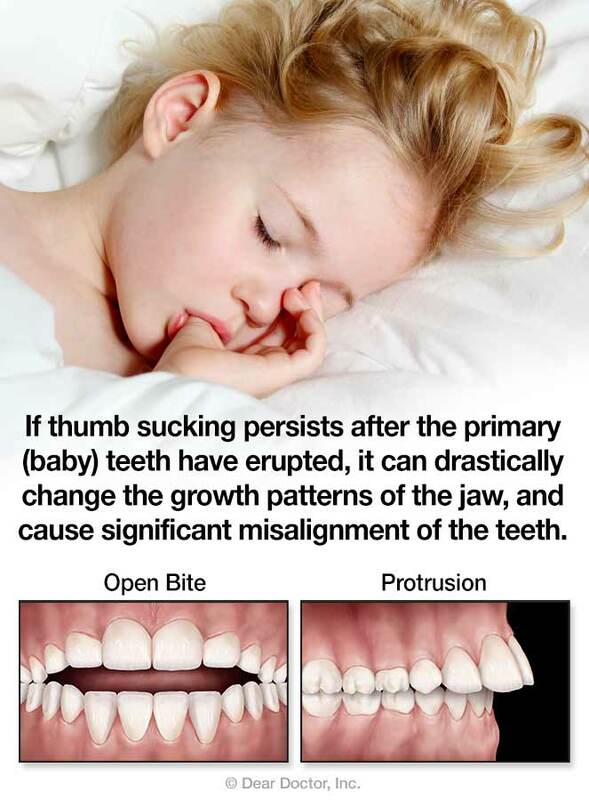 Children who are particularly vigorous thumb suckers are even more likely to change the growth patterns of the teeth and jaws. If your child has a thumb or finger sucking habit that has persisted past the age of three, and you've been unable to tame it, then it may be time for you to visit our office. We will consider treating your child with a “habit appliance” such as a fixed palatal crib or a removable device. 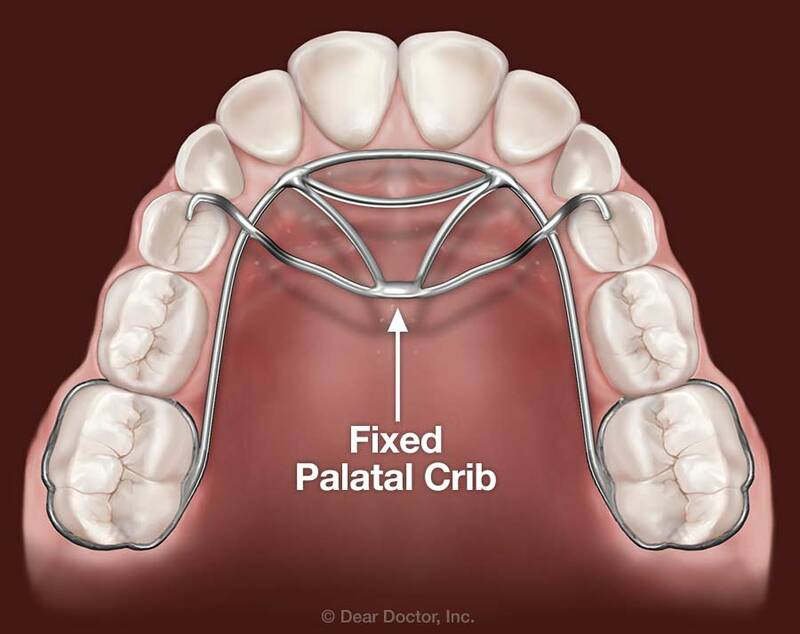 This crib isn't for sleeping — it's a small metal appliance worn inside the mouth, attached to the upper teeth. Like thumb sucking, tongue thrusting is a normal behavioral pattern in young children. It's actually part of the natural infantile swallowing pattern, which will normally change on its own — by the age of 4, in most children. If the pattern doesn't change, however, it can lead to problems similar to those caused by thumb sucking: namely, problems with tooth alignment and skeletal development. Fortunately, this problem can be successfully treated with a habit appliance that's very similar to a fixed palatal crib.